Super Fancy and Devastating "Spells"! Along with weapons, Weapon Skills, and Unique Skills, there are Spells that characters can cast, too! 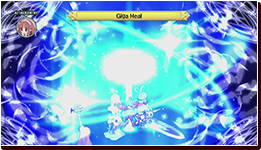 The main difference between Spells and other Specials is that they are learned by magic using units as they level up. They can also be transferred to other characters by using the Master and Apprentice system, allowing non-magic using units to learn Spells. Spells aren't limited to those that attack enemies. Spells can heal ally units, or even change the stats of both allies and enemies! Having at least one unit who can learn Spells will give you a big advantage in battle. High Area, High Power! One of the biggest appeals of using Spells is their areas of effect and high power! When they first learn a Spell, the area they can cast it is small, but as they use it over and over again, they'll be able to effect a larger area! Super Fancy Animations! As they level up, units can learn higher tier Spells. The higher the tier of the Spell, the fancier their animation gets! Make sure to check out the animations for the top tier Spells.